WTH?! (What the Heck?) moments are attempts to find the memorable and the off-beat perspective on Longhorns sports. Here are some interesting moments from the Texas game against the New Mexico State. 1st Quarter (11:38) WTH Crash Davis?! We’ve heard about this quick strike offense. Nothing would have been better than to have Mike “Magic” Davis get the team into the red zone. He ended up fumbling the ball to end any hope of a first score. He would more than make up for it later. 1st Quarter (3:29) WTH Punter?! What a letdown when your team cannot make a first down. Well, looks like punter Anthony Fera puts a little more excitement into 4th down with a booming 68 yard punt that is downed at the 1 inch line! 2nd Quarter (15:00) WTH Godzillatron?! A lot of us are happy that LHN is on Time Warner Cable. Too bad the University forgot to pay their cable bill for the stadium’s television set which was on the blink and out for a good portion of the quarter. 2nd Quarter (8:45) WTH Head Games?! Never seen that one before. The NMSU backup quarterback signaled for the snap just as his wide receiver was coming in motion. The ball bounced off the receivers head and rolled around as a fumble. At least the receiver, Bergstrom, used his head and recovered it. 2nd Quarter (1:48 & 1:08) WTH Wonder Twin Powers?! This duo did not transform into an animal and water, but it did electrify the dormant UT crowd (99,623) before halftime. The explosive TD catch and run by John Harris (54 yards) and Daje Johnson (66 yards) made the walk into the locker room a little less uncomfortable. 3rd Quarter (15:00) WTH Gutsy?! The coaching staff for NMSU decided to try an onside kick. No risk it… no biscuit. Did not work, but you gotta give them credit for trying. 3rd Quarter (10:27) WTH Ash?! David Ash galloped 55 yards for a touchdown to pad his rushing stats for the night. (91 yds. rushing + 343 yards passing) He had a tremendous second half. Let’s hope he wakes up earlier for the next game versus BYU. 4th Quarter (15:00) WTH House of Pain?! As the kids say “Epic Fail.” The crowd did not respond when the loud speakers starting playing “Jump.” Time to kill any thoughts of making this a tradition. I been to a few Badger football games… this is not a Wisconsin type fan base. 4th Quarter (2:34) WTH Magic?! Mike Davis redeemed is nickname with a spectacular one foot in bound catch in the end zone. Too bad the refs missed it when they did not signal touchdown but decided to call pass interference. Luckily the replay booth got it right and awarded the TD to Davis. 4th Quarter (:00) WTH Major?! 715 yards! 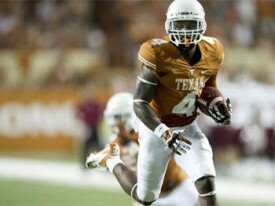 The most yards EVER recorded by a Longhorn football team. Guess the Applewhite offense is up tempo. Greg Davis must have been smiling after this one. Next up for the Longhorns is a trip to Utah to play the Cougars of BYU on September 7th. Game just under way in Spokane, Washington and I think there’s more people in my living room watching the game than there in the stadium. Tough trip for fans from New Mexico or Texas but I’m surprised more locals wouldn’t come out to see Kevin Durant and some great basketball in person. [tag]New Mexico State[/tag] could be a tough opponent for the Horns despite being only a #13 seed, Texas will have to play well to win tonight. I’ll post some random thoughts on the game throughout, hopefully Texas plays up to their ability and can advance to the second round. HDTV has a sponsor but no actual HD here in Dallas. Is anyone else getting the game in high def? Three minutes or so before [tag]Kevin Durant[/tag] gets his first real touch on offense. New Mexico State is pressing to get us out of our base offense and make it harder to get KD involved. We’ll see if Texas adjusts. Good to see D.J. Augustin off to a good start. Because of the NMSU press he’s been able to find seams in the defense and go hard to the hoop. Reggie Theus kind of looks like a guy from Hustle & Flow. About seven chance at a bucket there and no points for Texas. Good job on the offensive glass but somebody’s got to put the ball in the basket. DJ better be well rested. NMSU’s defense is really working him out there and he’s having to expend a lot of energy. CBS really has a knack for making sure you don’t get to watch the game you want to. We’re watching other random games instead of going back to our game that’s back under way. Bullcrap foul called on Augustin. A lot of low scoring games in the first round, including this one. Another terrible call on the charge on Kevin Durant. The NMSU guy was clearly moving. NCAA officials have fallen in love with calling the charge this season and have missed a ton of calls because of it. Augustin and Durant only Horns who have shown up so far tonight. Damion James has been active but needs to finish. Apparently the refs looked up and noticed they hadn’t called any fouls on Texas because they’ve called four completely awful fouls in the last few minutes now. Cheap. And now a cheap BS call against the Aggies. And after back to back crap calls against James the refs have called back to back bad fouls on NMSU big man. Durant starting to feel it a little. Texas on 12 to 3 run since I put on the lucky game day shirt. I take the blame for the slow start. Aggies get a couple of looks at the basket but good defense by the Horns to end the half. After trailing for most of the half Texas goes into halftime with the lead. Deadspin previews Texas’ first round match-up against New Mexico State.